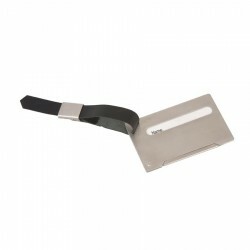 Luggage Tags are perfect for corporate traveler or giveaways. They may be compact in size but they are certainly effective in boosting brand visibility. 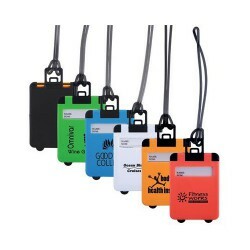 These luggage tags are customised with your corporate name or logo and can be handed out during tradeshows or sales seminars. Promotional Product Experts boasts of an excellent collection which includes deluxe luggage tags in metal, leather and PVC plastic material. They come with attachments in the form of loops or straps. Protect your luggage with the TSA (American Transport Security Administration) approved lock. When TSA needs to check your luggage in your absence they can open this lock using universal "master" keys so that the locks may not have to be cut. With koeskin luggage tag. Aluminium luggage tag with leather strap. Boxed. 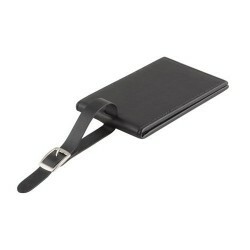 Stylish covered black luggage tag made from split leather. Suitcase shape luggage tag with PVC spaghetti loop and white hidden address panel.